I hope I've got all these right. What a wonderful thing is the Internet! No blog today, just a few nice things to share with you on this Christmas morning. I haven’t forgotten readers from the Russian tradition or others following the Old Calender. I'll try to do something for you on 6 January. 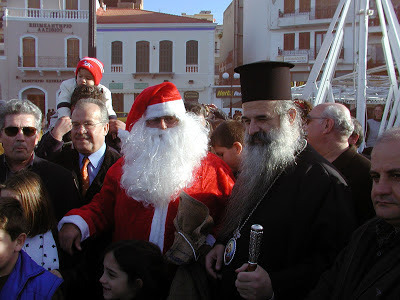 Meanwhile, in Crete, Santa Claus even visits the Bishop! 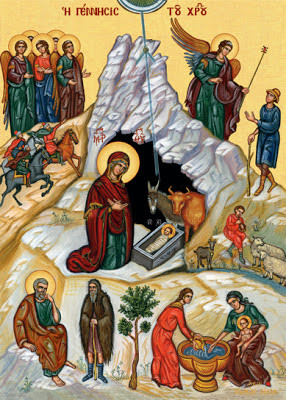 For those who are not familiar with Greek traditions, the chap in the red suit is actually Aï Vasili (based on Agios Vasilios or St. Basil). Although he bears a remarkable resemblance to Santa Claus, he visits the children of Greece on 1 January. Needless to say, the kids don't worry about the details, they just enjoy the presents! Since I am a firm believer that nepotism should be kept in the family, I'd like to share this with anyone who hasn't yet seen it. 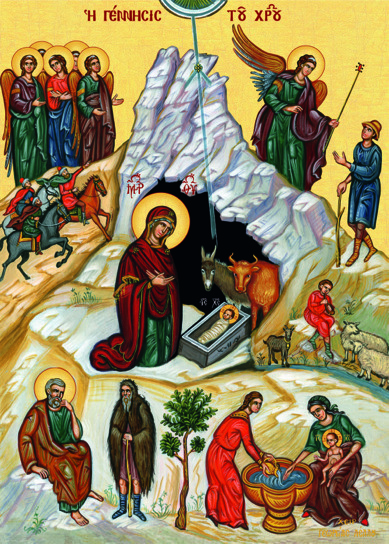 The Christmas hymn, words and music, was written by my son Michael and sung by his daughter Melina in the Orthodox Cathedral of St. Sophia in London. Michael also did the filming and editing. And finally, the joyful sound of more church bells, this time from Christchurch Cathedral, New Zealand on Christmas morning. Filmed before the tragic earthquake of 2011.